Miles Davis And Gil Evans Create More Than Mere Sketches Of Spain. A sketch suggests a work on its way to completion. The beginning of something with potential. The only thing preliminary about this record seems to be its length. But it’s not really brief at 41 minutes. At least not by twelve inch record standards. The music just happens to you a bit too quickly. It leaves you wanting more. And in that way alone it seems incomplete. But satisfyingly so. Perhaps that’s one of the many secrets of this record. Recorded between Fall of 1959 and Spring of 1960, Sketches of Spain is much more than a rough draft of something more to come. It’s a full, emotional portrait of a seemingly beautiful series of events we’ll understand later. The orchestra and jazz group that created this masterpiece bring the compositions to life by shaping and coloring them as they play them. The album is composed of five songs magically connected to one another by Miles Davis’ flugelhorn. The songs include Concierto De Aranjuez, Will O’ The Wisp (from “El Amor Brujo”), The Pan Piper, Saeta, and Solea. As I sit here listening – first to a 1980s stereo reissue and then to an original “six eye” monophonic copy – I’m impressed by the picture painted by Mr. Davis and Mr. Evans. The recordings seem to be announcing something wonderfully warm but melancholy all the same. At times the record seems to be made up of a tension that builds between a tight jazz group – Miles Davis on flugelhorn, Johnny Coles on trumpet, Paul Chambers on bass, Jimmy Cobb on drums, Elvin Jones on percussion – and an open-armed orchestra that slowly surrounds them, occasionally pressuring them to deliver on their Spanish promise. It happens to be a cool, rainy Fall day as I attempt to unravel all these Sketches of Spain and what strikes me is the incandescent swirling of amber, russet and golden hues glowing within my mind as I listen to the record over and over. The recordings themselves have warmed my heart and connected me to a time and place I’ve never been. 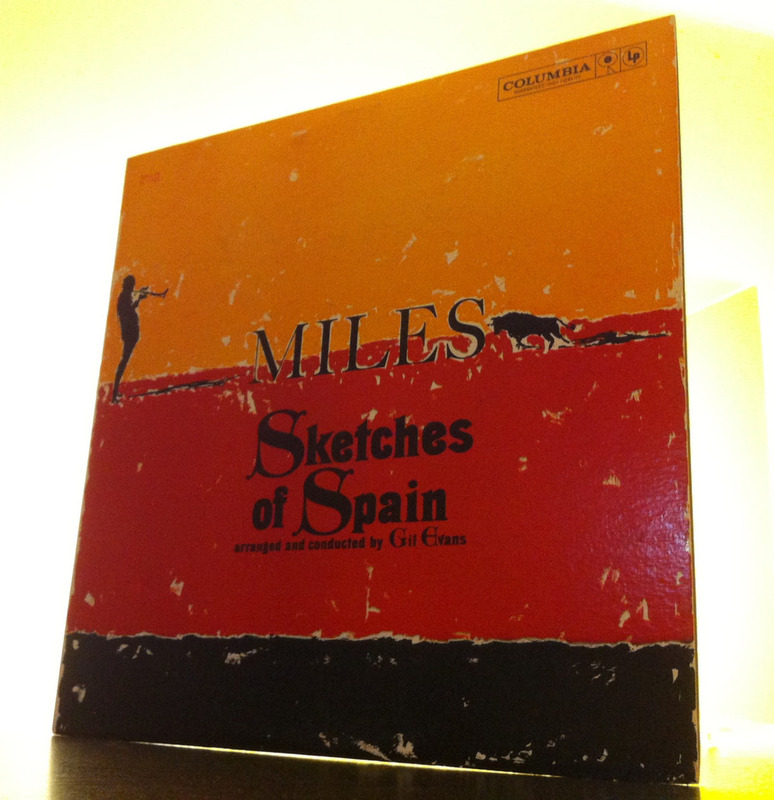 And that’s the rare, wonderful feeling created by Miles Davis, Sketches of Spain, arranged and conducted by Gil Evans. A jazzy, orchestral, Spanish gift to the future from so long ago. Put on your headphones, close your eyes and float over the Iberian peninsula by clicking this very sentence. As I mentioned above, I reviewed a 1980s stereo pressing and an original mono “six-eye” pressing. I expected huge differences between the two. The differences weren’t huge. Don’t get me wrong, there are differences. The mono copy has more immediacy and force. More punch. But the stereo reissue sounded good too. More enveloping. As is typical of any comparison of the same recordings pressed some thirty years apart, there’s some loss of information over the years. There’s just not as much music in the grooves of the reissue. So what? It’s still great. Those two pressings weren’t enough for me anyway. I put on a compact disc copy of Sketches of Spain from the Miles Davis/Gil Evans Complete Columbia Studio Recordings (burned from my brother’s box set). While the cd sounded clear as a bell it also sounded the most different. The mixes sound different too. I bet they are. Too trebly. That said, it’s not like I suddenly and shockingly thought I was listening to Jim Nabors singing the Whiffenpoof Song. It was still Miles, man. My guess? The copy to own is the original stereo six-eye Columbia pressing.